The Brenau Wellness Committee & the Staff Development Committee would like to invite all faculty and staff to a couple of workshops regarding personal finances. 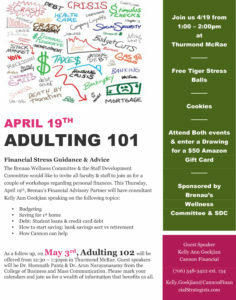 As a follow up, on May 3, “Adulting 102” will be offered from 12:30-1:30 p.m. in Thurmond McRae. Guest speakers will be Dr. Humnath Panta and Dr. Arun Narayanasamy from the College of Business and Mass Communication. Please mark your calendars and join us for a wealth of information that benefits us all.